According to an extensive 2010 report by IBM of 1500 CEO’s worldwide, Creativity is now the most desired leadership quality for organizational success. In a rapidly changing world creative leadership skills are essential. This report presents the findings of a 4 year impact study on a unique Student / Business Creative Leadership Conference that has taken place annually in Rochester, NY from 2006 to 2009. Started in 2006, the conference is a professional 3-day experience for high school students held in a professional environment, outside school walls. Students work through two days of intense skills training focused on creativity, problem solving, team work and leadership. The final day culminates with a highly authentic student / business collaboration. Teams of trained students lead clients through a half-day creative problem solving session. Clients walk away with a unique understanding of their real challenge, innovative solutions and a “next steps” action plan. This impact study assessed student participants from the 2006, 2007, 2008, and 2009 conferences held in Rochester, NY. Students were juniors and seniors from eight different school districts, enrolled in a Monroe #1 BOCES, Career and Technical Education program. Five different methods were used to assess conference impact. These included post conference surveys, pre and post test “Hope Scale” assessment; follow-up interviews with past participants; follow-up survey to past participants and a literature review of research on the topic of training students in the Creative Problem Solving Process. The research data showed exciting evidence that the conference provides a lasting and meaningful impact on students. 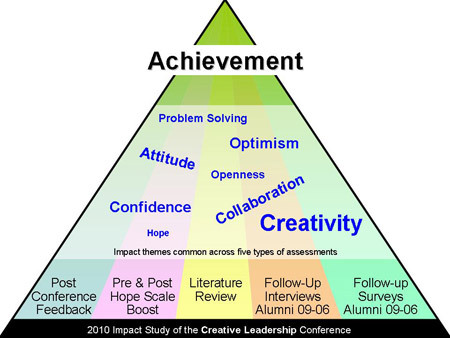 More specifically, confidence, creativity, optimism, and skills associated with collaboration and problem solving emerged as common themes of impact across all five methods of assessment. One student shared a story of breaking a Niagara University Service Leadership record after leading his team through a creative problem solving session. All of which are highly valued in the workplace. Confidence, creativity, optimism, and skills associated with collaboration and problem solving emerged as common themes of impact among the five different research methods used. All of which are highly valued in the workplace. Interviews were made with 13 students: 3 from 2006, 4 from 2007, 5 from 2008, and 1 from 2009. 62% of the students interviewed have taken on leadership roles. 14 different leadership roles where shared. One student was the President of a college student organization. 81% of past participants still believe the conference was one of their best learning experiences. One student used what he learned at the Leadership conference to lead a campus team to log the most “Service” hours in Niagara University history. A pre and post “HOPE” Scale assessment was administered to 2008 and 2009 participants and showed an increase on scores. 2009 scores showed a statistically significant increase. 6 Research papers were found showing similar content used with students and each showed similar impact themes: Creativity, problem-solving, optimism, attitude. Numerous research was found working with adults using similar content.